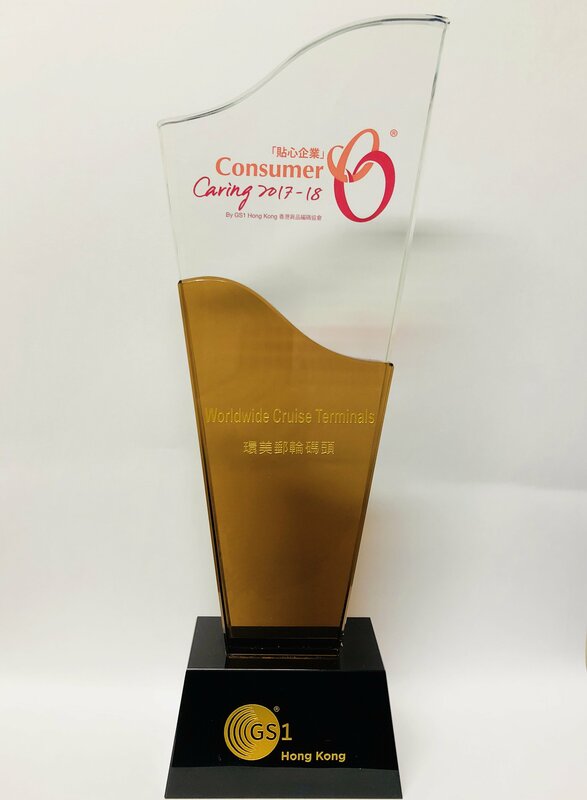 Consumer Caring Company Award 2018 presented by GS1. 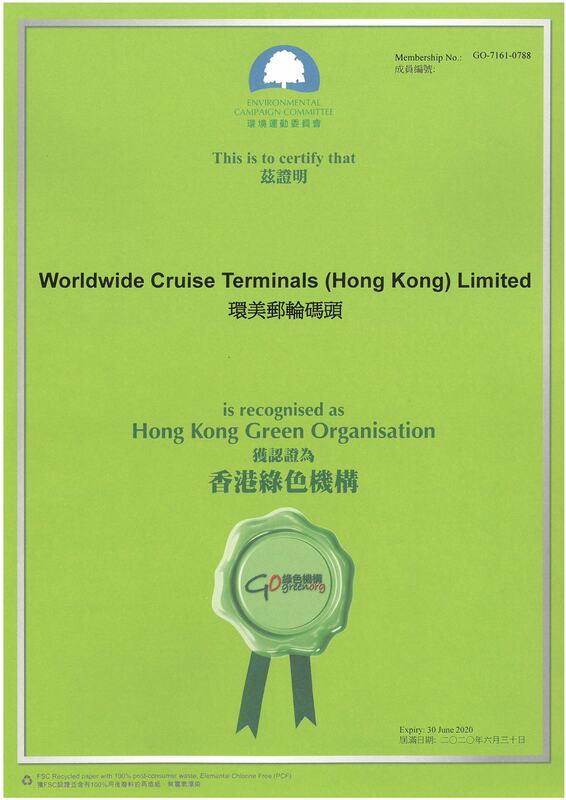 Received 12 March 2018. 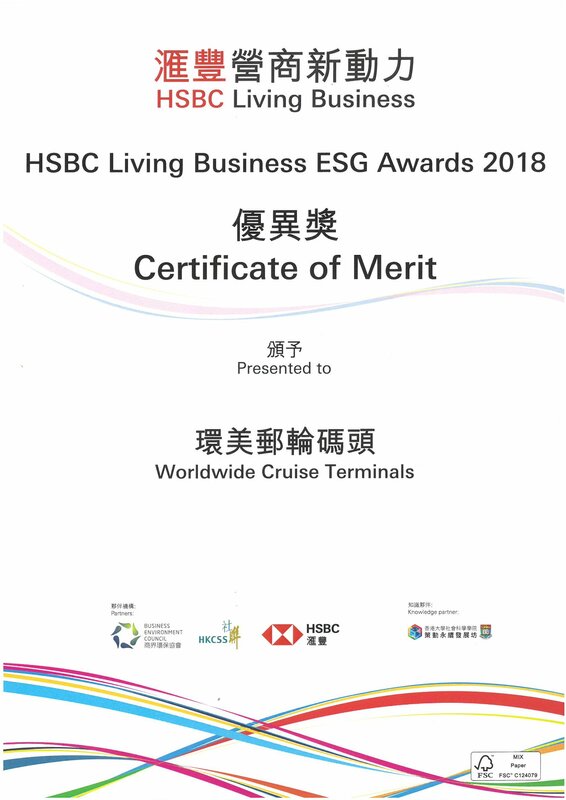 HSBC Living Business ESG Award presented by HSBC. 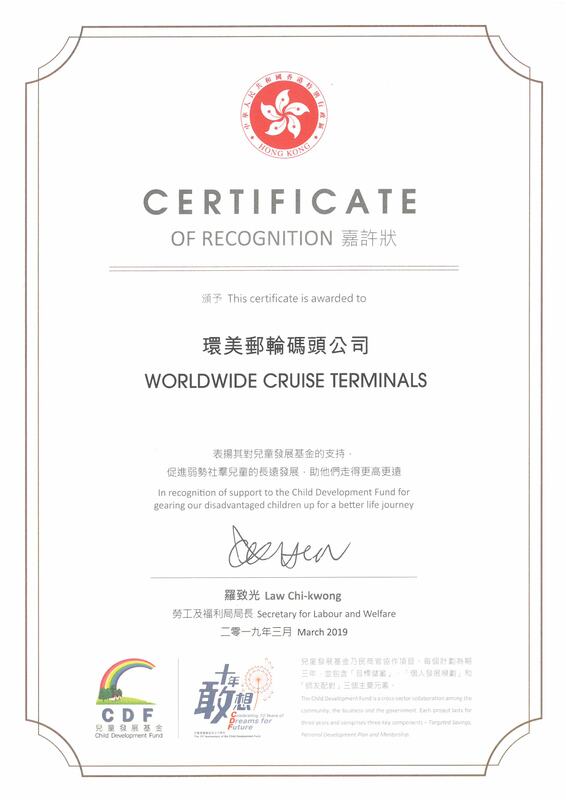 Received 11 March 2019. 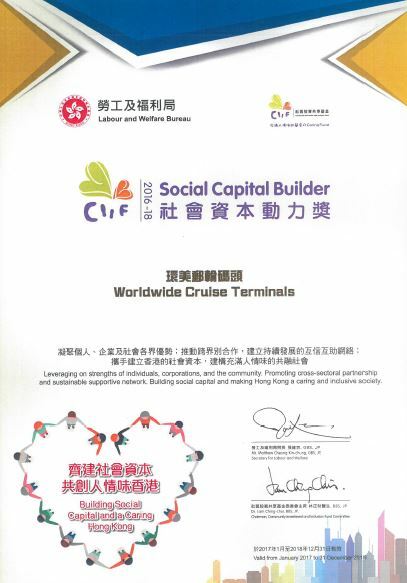 Certificate of Recognition awarded by the HKSAR government. 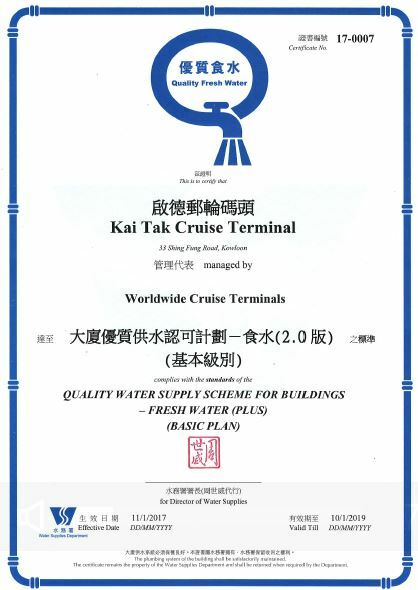 Presented 9 March 2019. 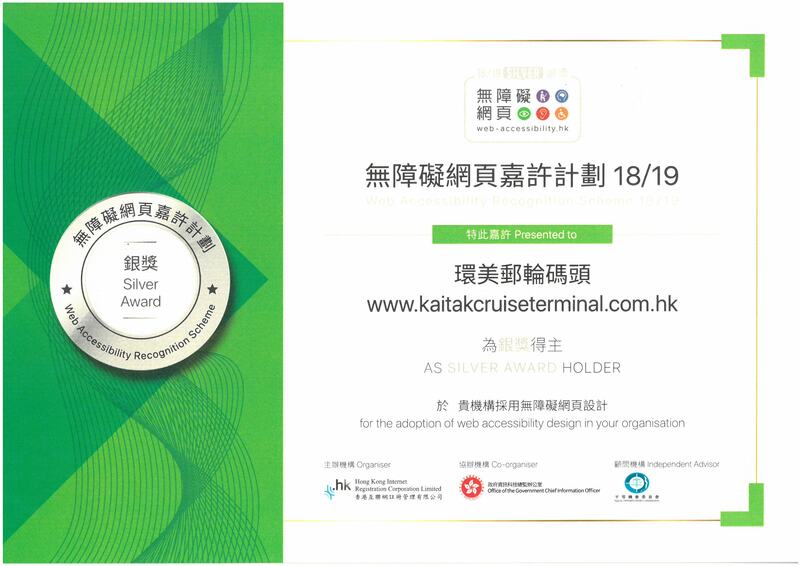 Silver Award Winner for the Web Accessibility Recognition Scheme 18/19. 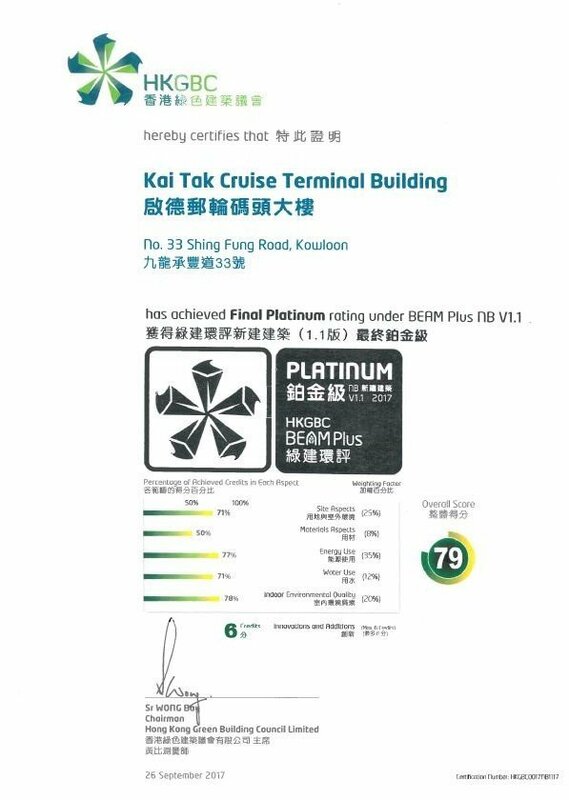 Received 16 Jan 2019. 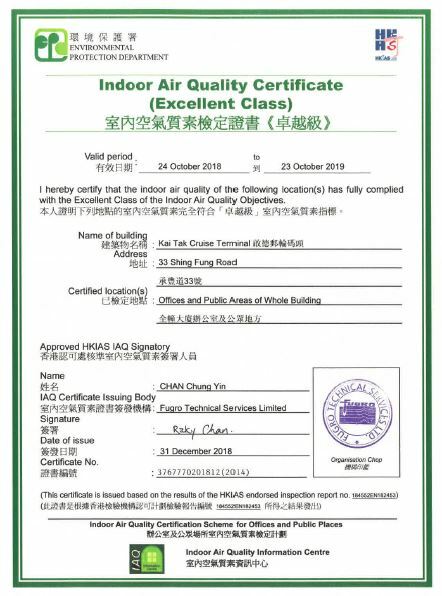 Indoor Air Quality Certificate (Excellent Class) 2018-2019. 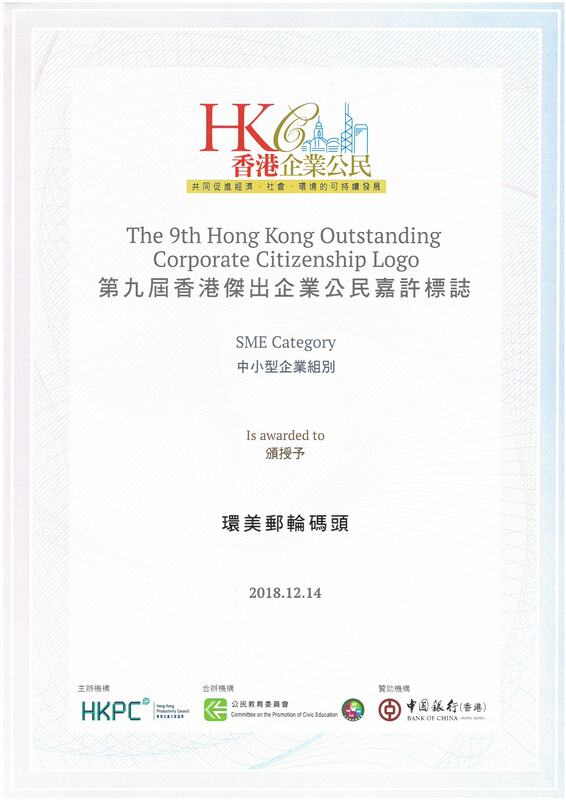 Issued 31 Dec 2018. 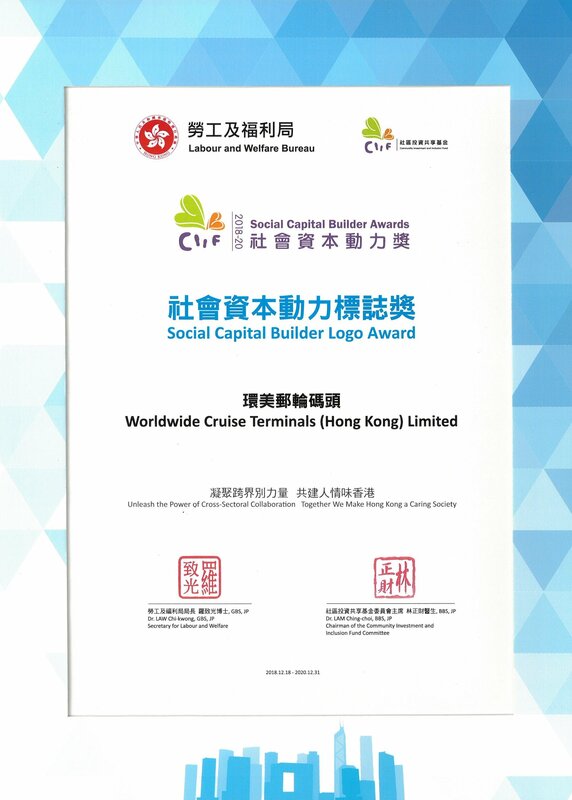 “Social Capital Builder Award” (consecutively awarded) by HKSAR’s Labour & Welfare Bureau. 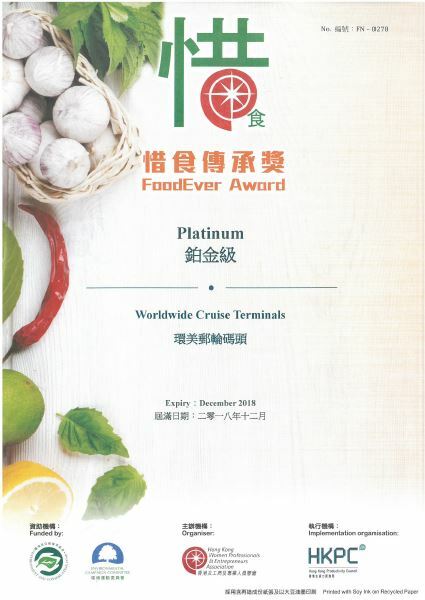 Received 18 Dec 2018. 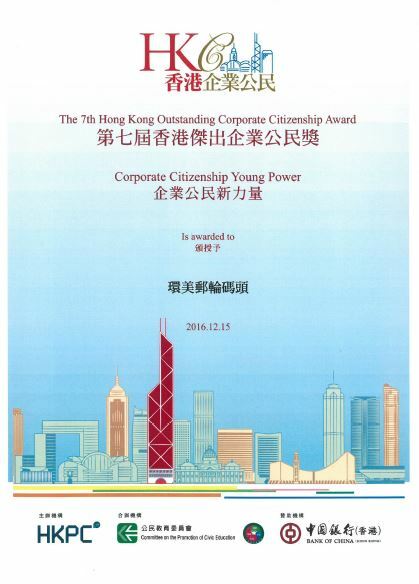 The 9th Hong Kong Outstanding Corporate Citizenship Logo Award. Received 14 Dec 2018. 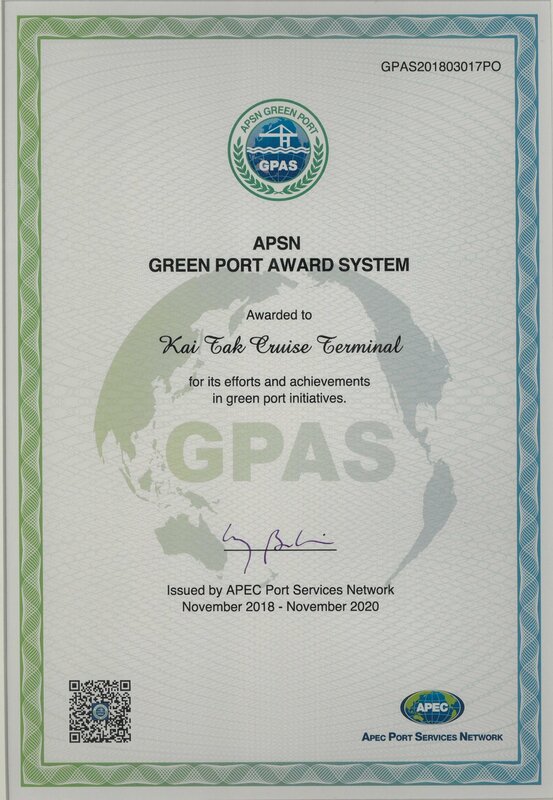 APEC Green Port Award 2018 issued by the APEC Port Services Network. Received on 15 Nov 2018. 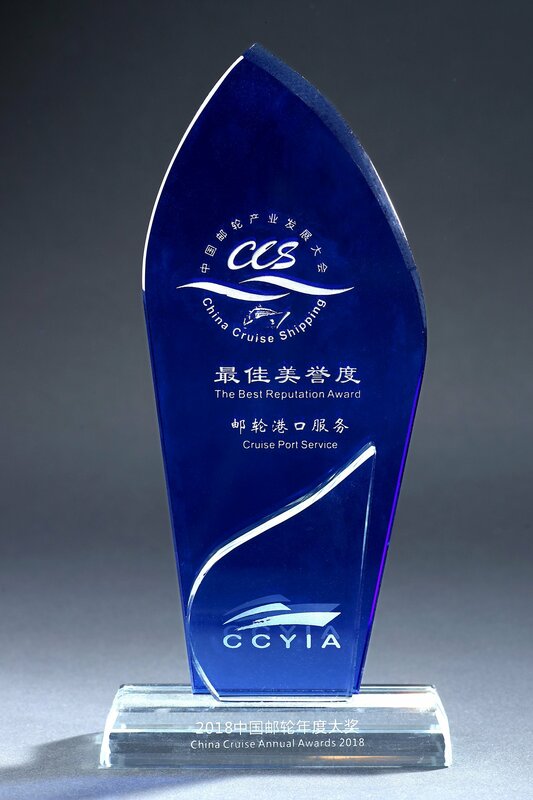 CCYIA Best Reputation Award in Cruise Port Service. Received 1 Nov 2018. 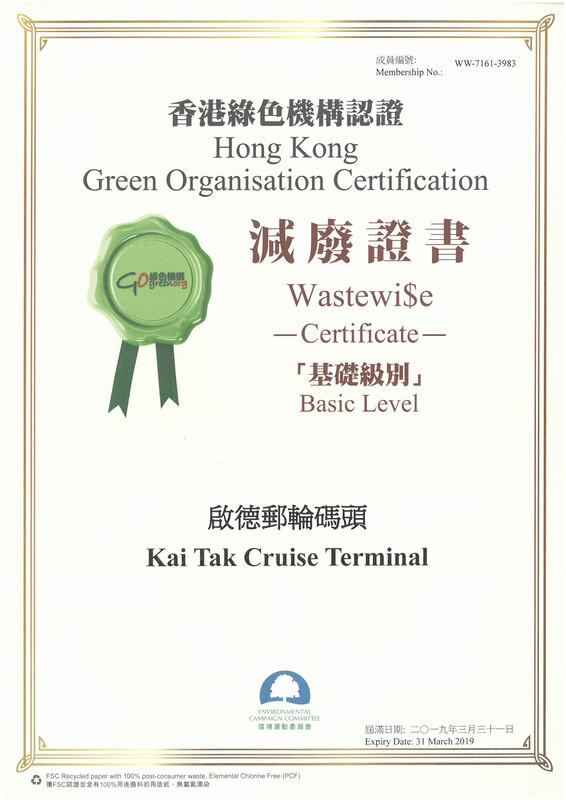 Wastewi$e Certificate presented by HKGO. 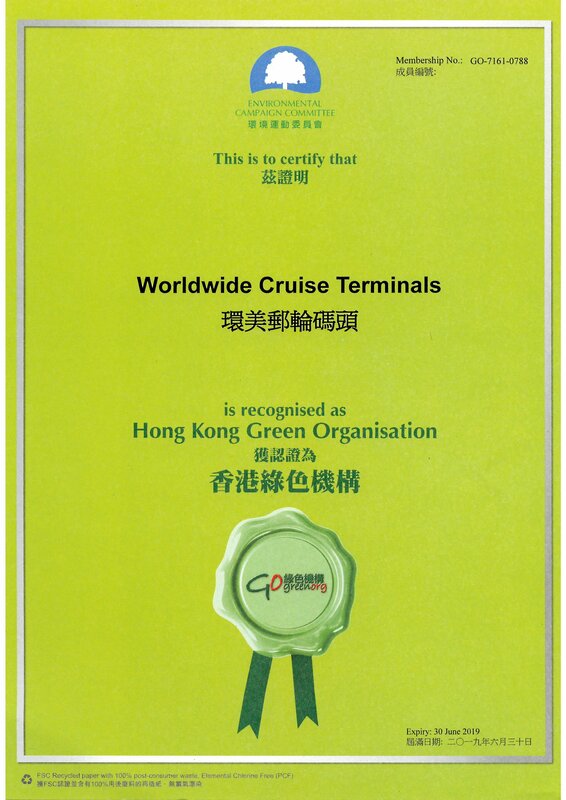 Most recently awarded on 28 Sept 2018. 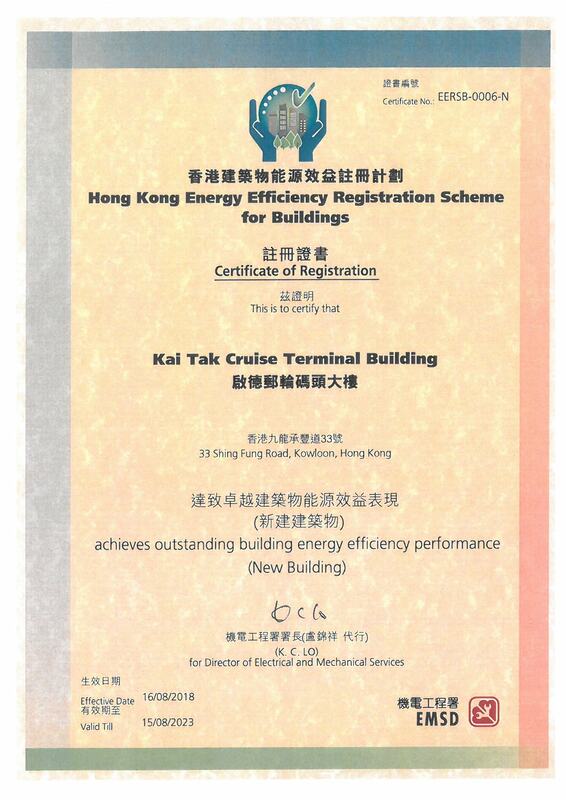 Outstanding Building Energy Efficiency Performance Certificate presented by EMSD. Received 13 Sept 2018. 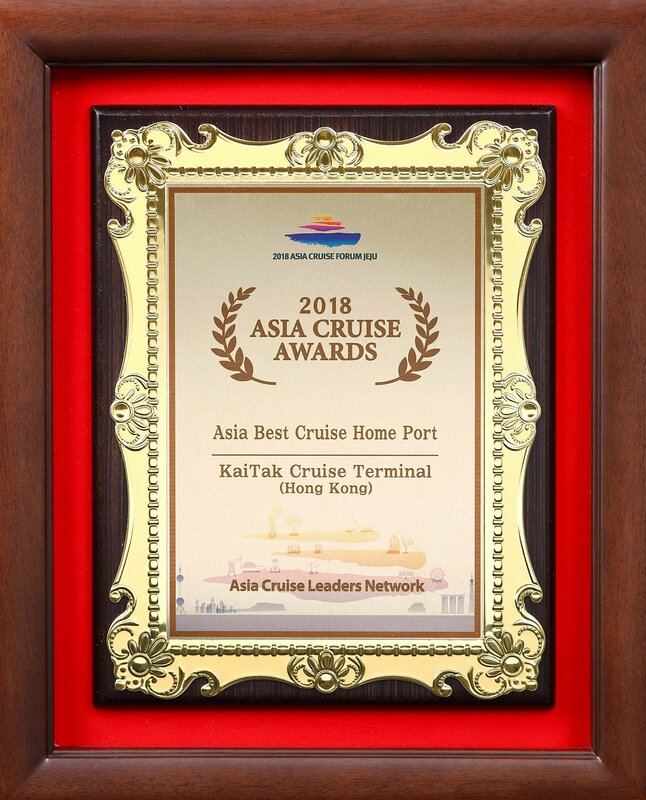 Asia Best Cruise Home Port 2018 presented by Asia Cruise Leaders Network. Received 29 Aug 2018. 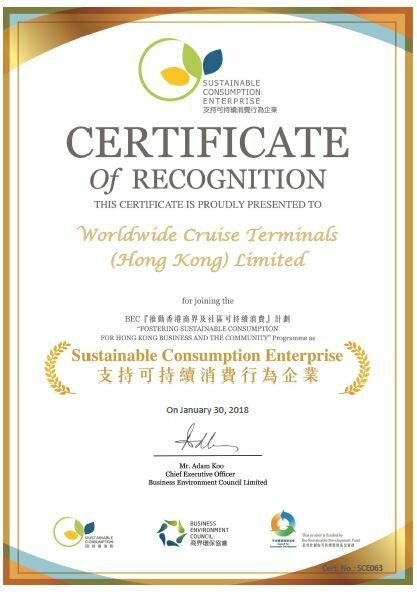 Hong Kong Green Organisation Award 2018-2019. Received 20 Aug 2018. 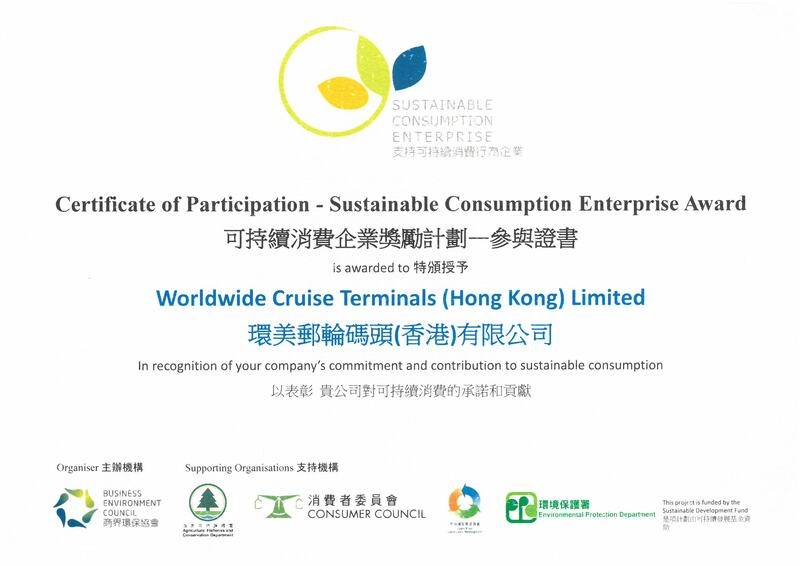 Sustainable Consumption Enterprise Award. 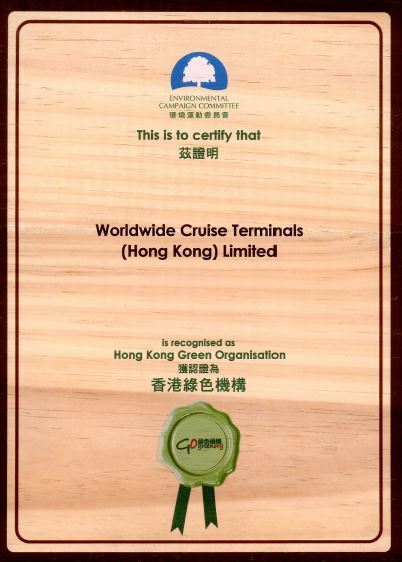 Received on 27 July 2018. 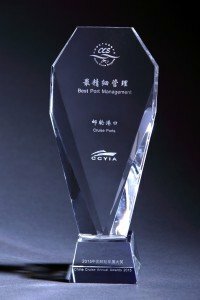 CILT Service Excellence Award 2017. 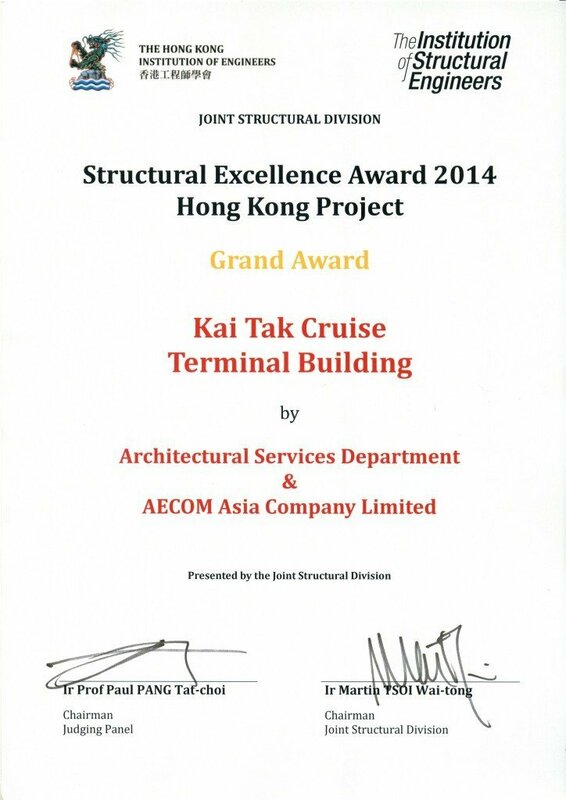 Received on 22 June 2018. 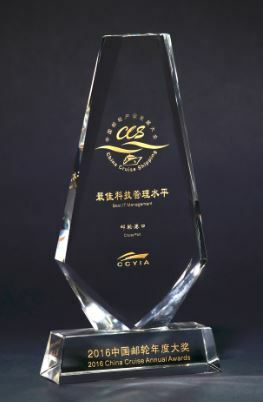 Bank of China EcoPartner Award (second consecutive year). 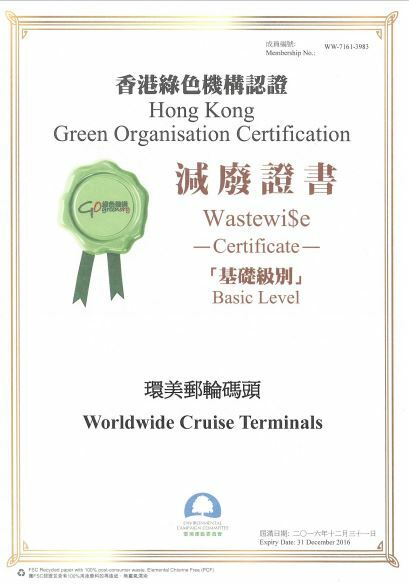 Received 31 May 2018. 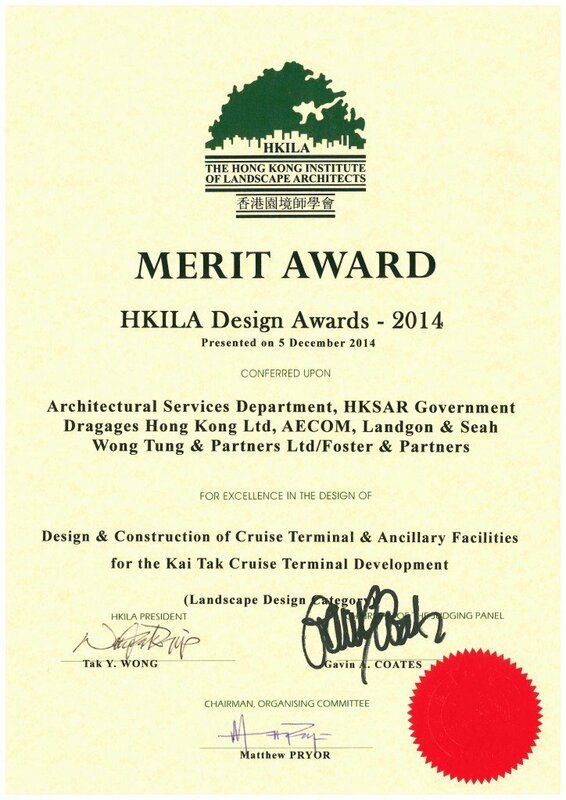 HKAEE Certificate of Merit received at the HK Awards of Environmental Excellence Ceremony on 4 May 2018. 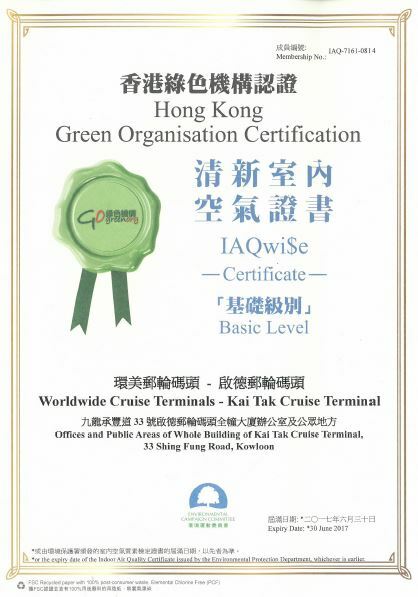 “Energywi$e Certificate” presented by HK Green Organisation. 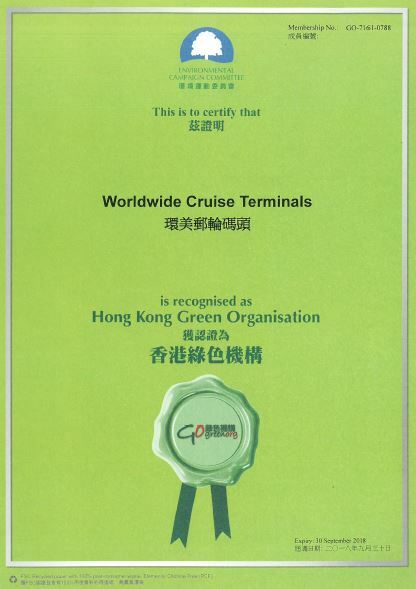 Most recently awarded on 26 Mar 2019. 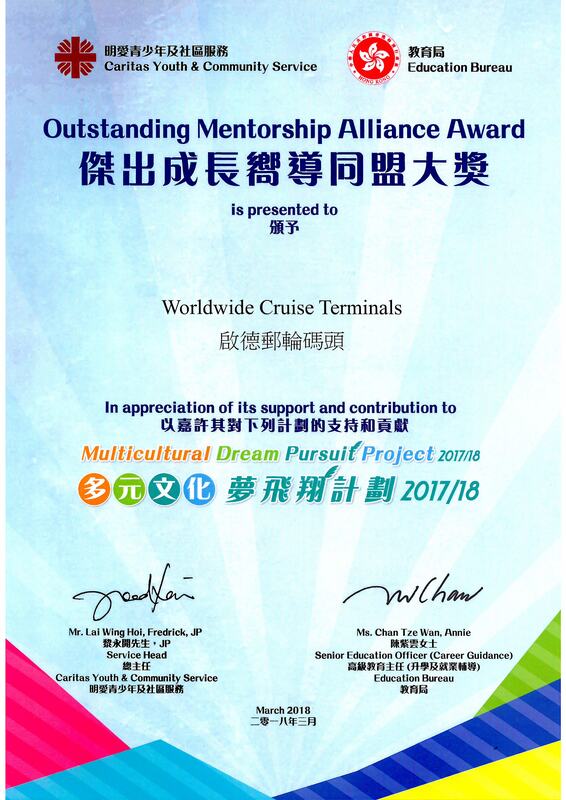 Outstanding Mentorship Alliance Award presented by the Education Bureau. 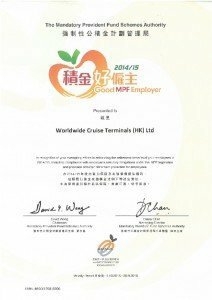 Received 17 Mar 2018. 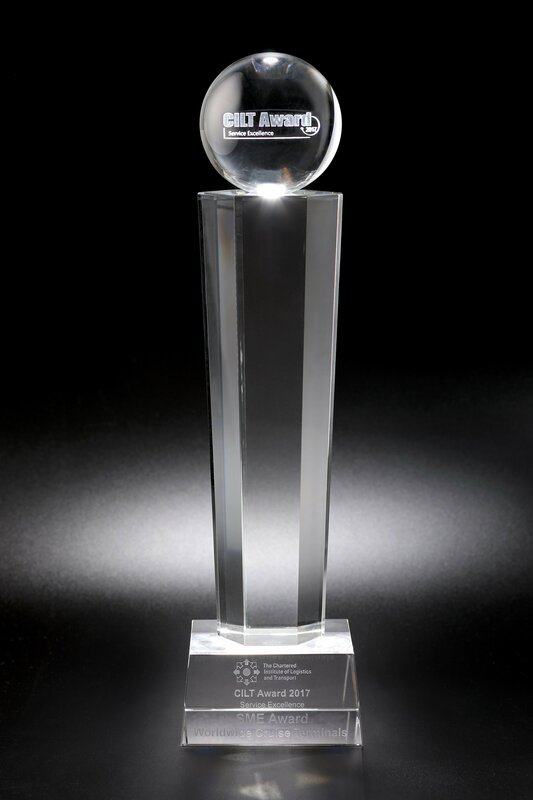 Barrier-free Company/ Organisation Award 2018 (valid from 2018-2021). Received 16 Mar 2018. 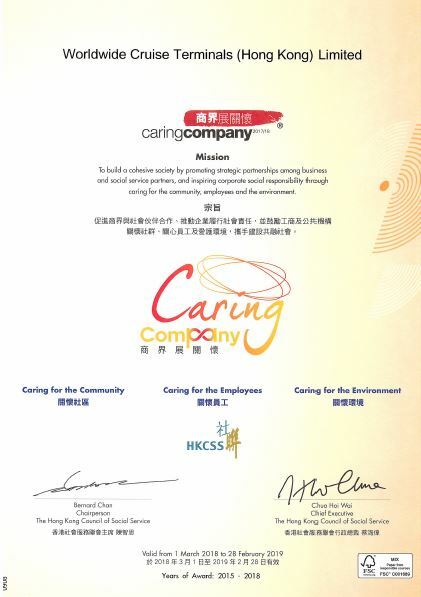 Caring Company Award 2018 (consecutive years awarded 2015-2018). Received 16 Mar 2018. 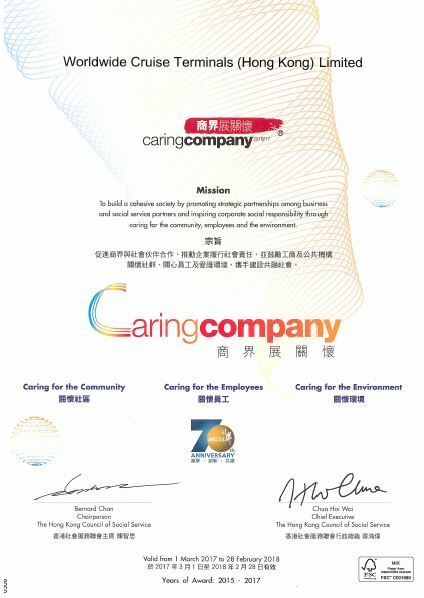 Sustainable Consumption Enterprise Certificate presented by BEC. 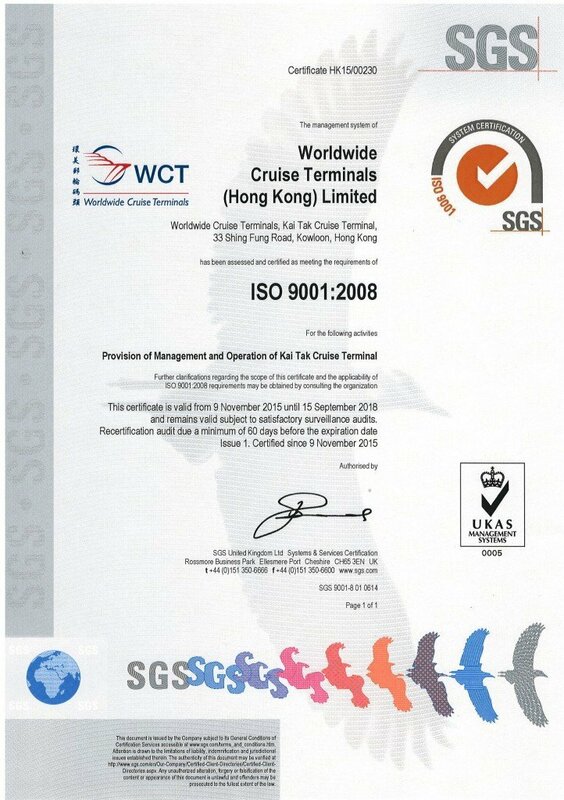 Received 30 Jan 2018. 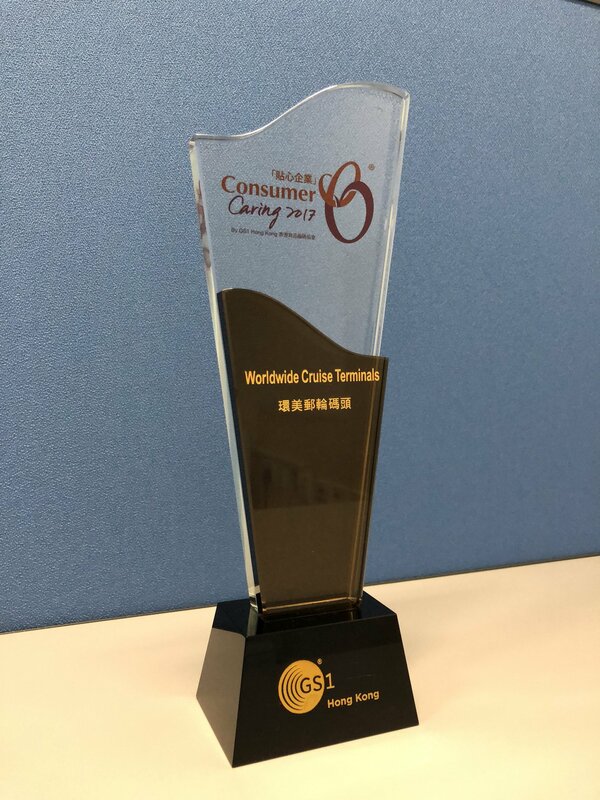 Consumer Caring Company Award 2017 presented by GS1. Received 12 Jan 2018. 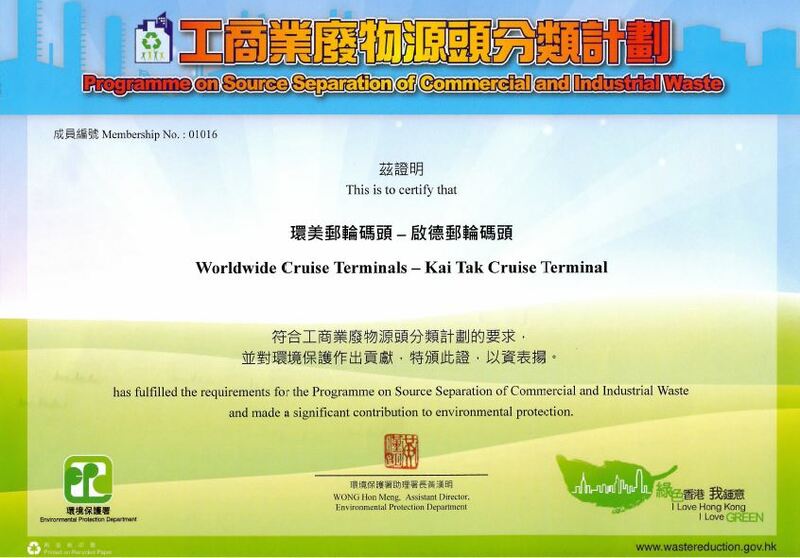 Source Separation of Commercial and Industrial Waste Certificate 2018. Received 9 Jan 2018. 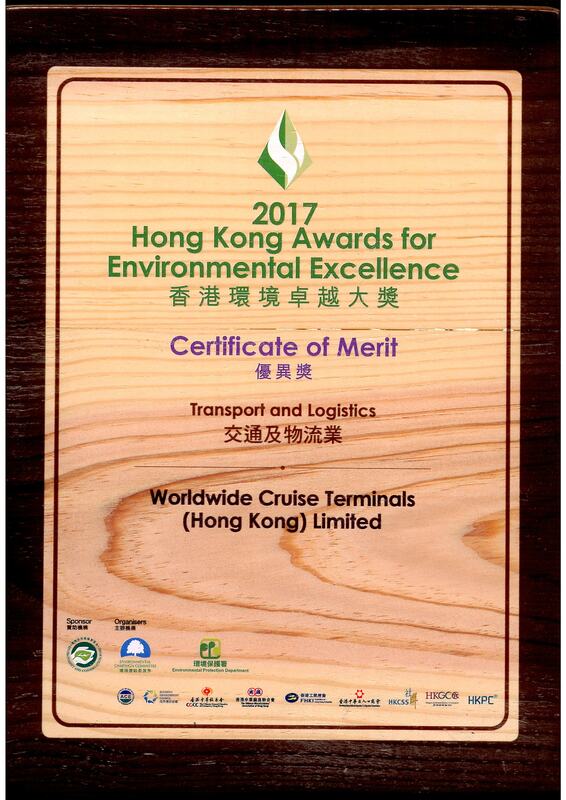 Hong Kong Green Organisation Award 2017-2018. Received 2 Jan 2018. 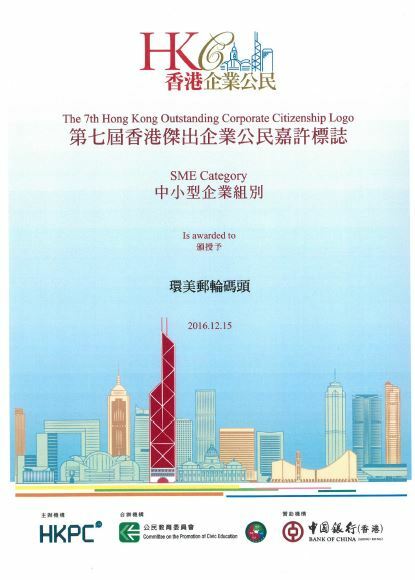 The 8th Hong Kong Outstanding Corporate Citizenship Logo Award. Received 15 Dec 2017. 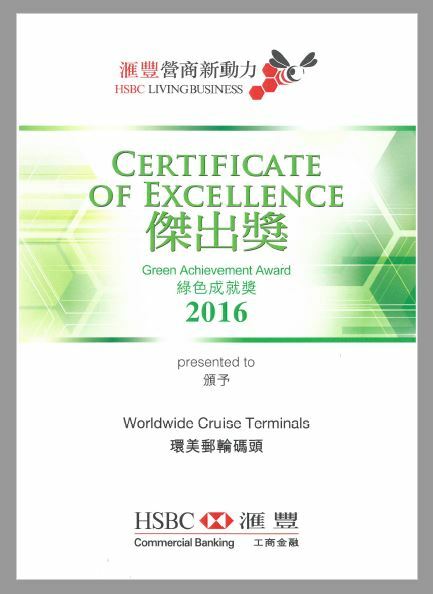 “Green Achievement Award 2017” presented by HSBC Living Business. Received 13 Dec 2017. 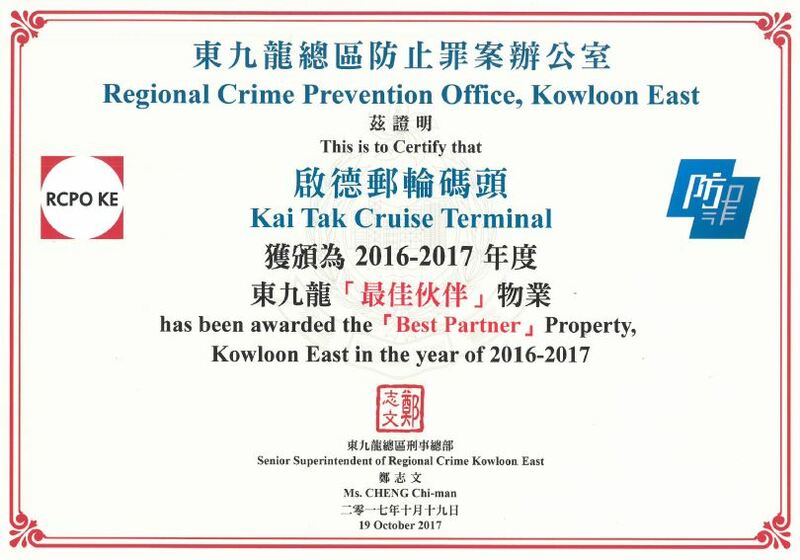 Best Partner Property Award. 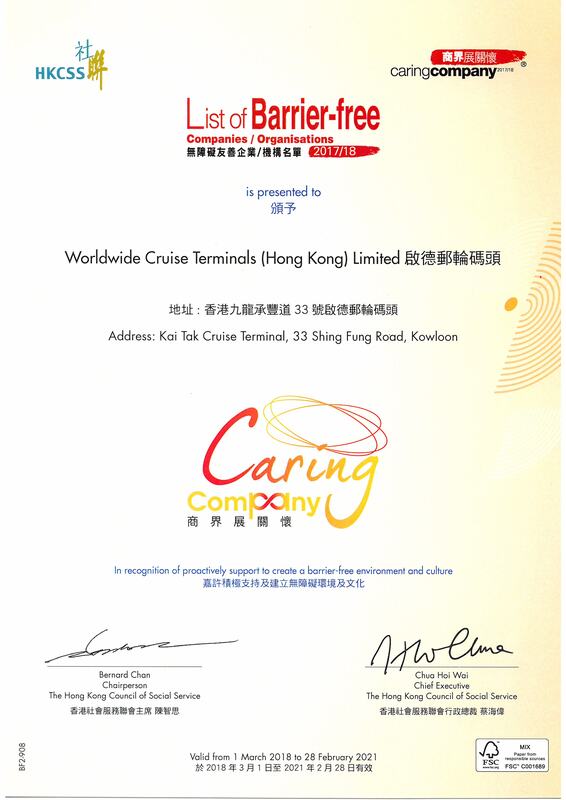 From Regional Crime Prevention Office, Kowloon East Police Force. Received 19 Oct 2017. 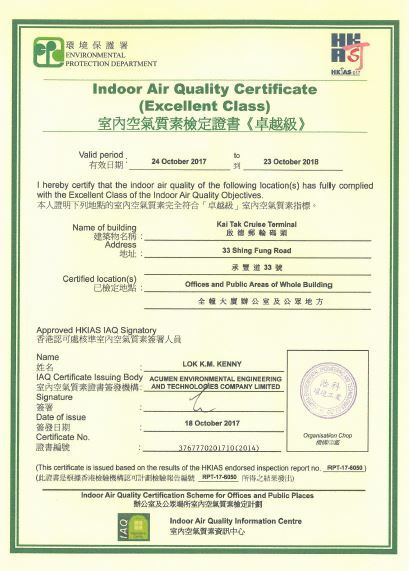 Indoor Air Quality Certificate (Excellent Class) 2017-2018. Received 18 Oct 2017. 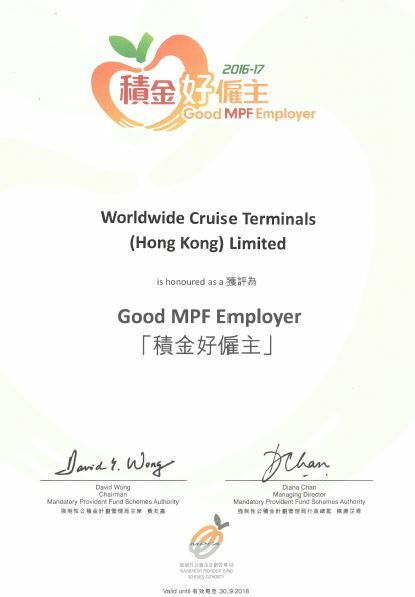 Good MPF Employer Award. Received 16 Oct 2017. 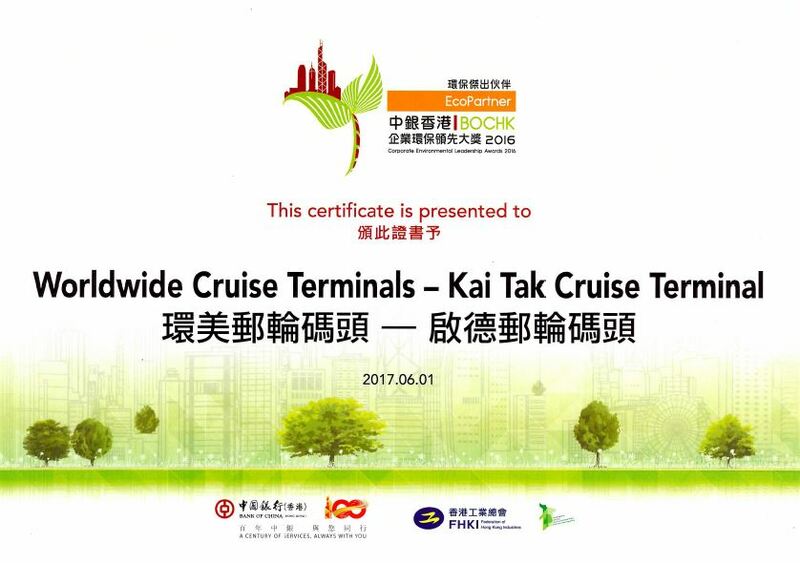 Seatrade Cruise Awards 2017: Environment Initiative Award Finalist. Received 6 Sept 2017. 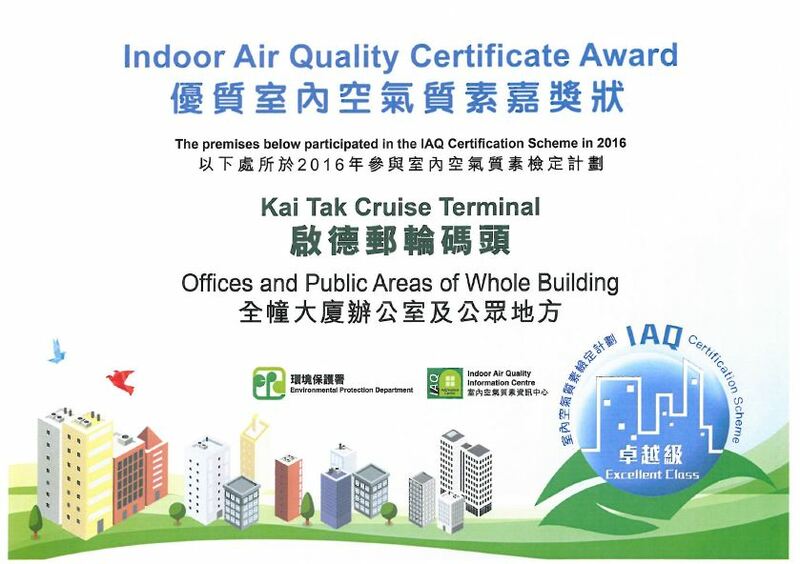 Indoor Air Quality Award. 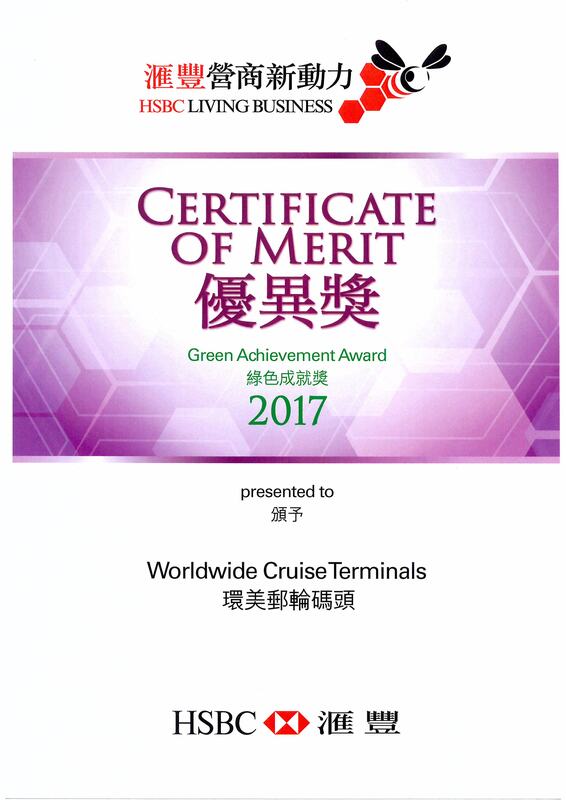 Received 6 June 2017. 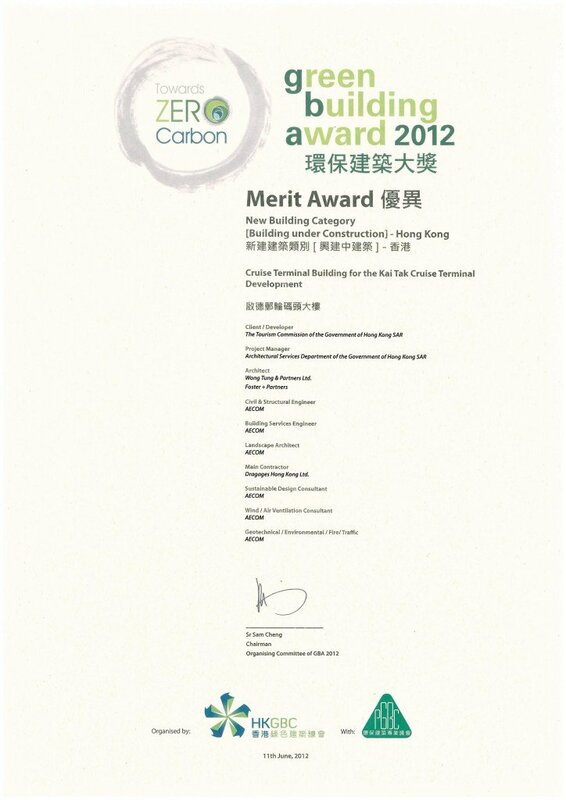 Bank of China EcoPartner Award. 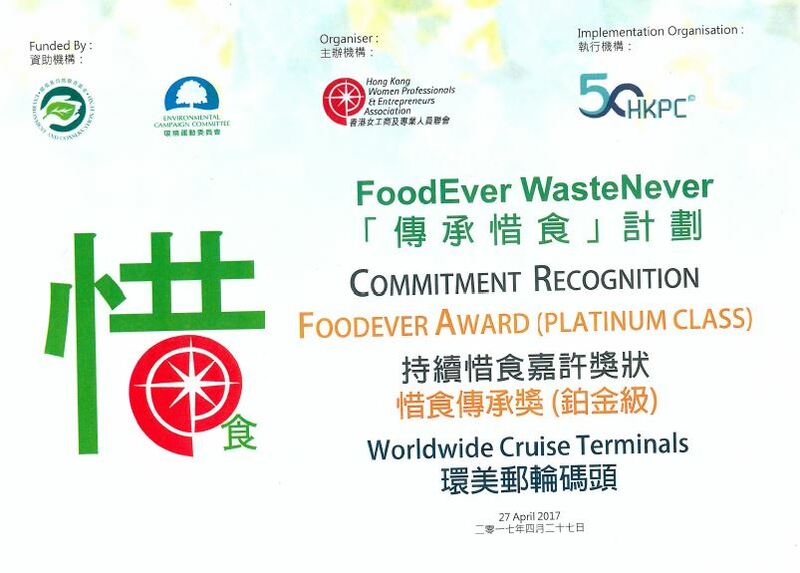 Received 1 June 2017. 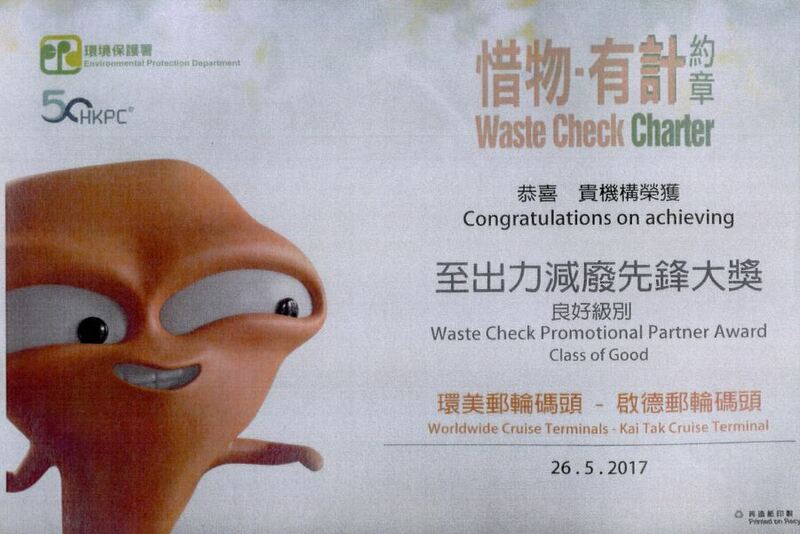 WasteCheck Charter Promotional Partner Award. Received 26 May 2017. 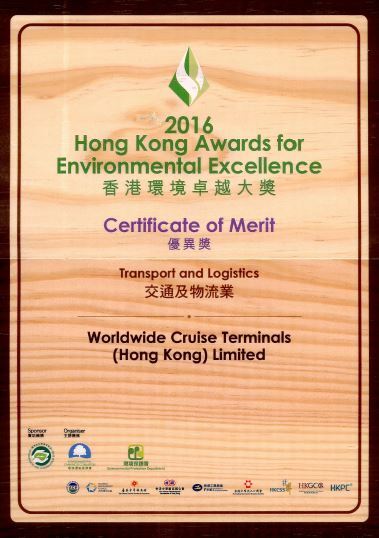 “HK Green Organisation Award” received at the Hong Kong Awards of Environmental Excellence Awards Ceremony. 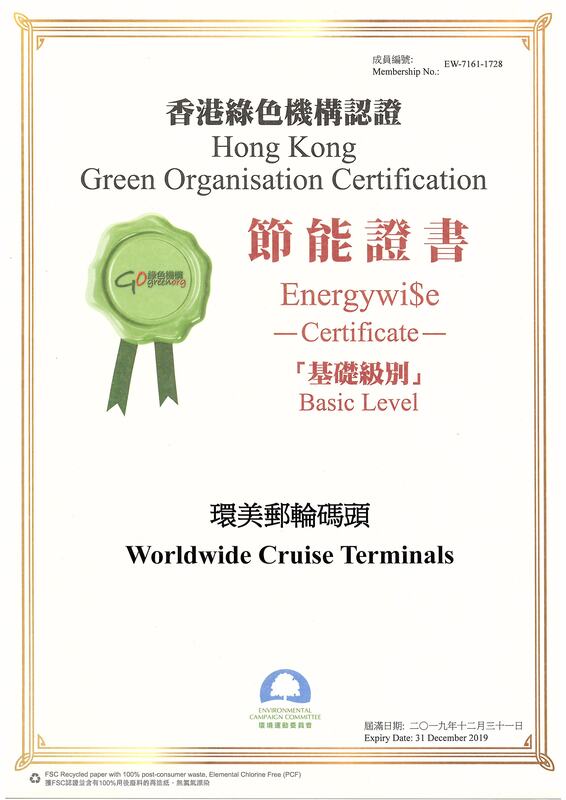 Energywi$e Certificate. 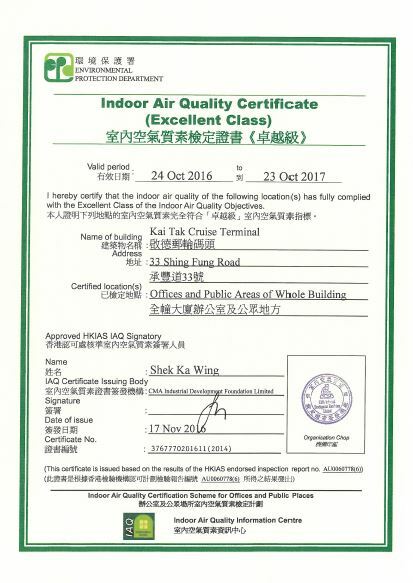 Certificate awarded on 21 Mar 2018.